Everyone who visits northern Michigan goes to Mackinac Island. But Mackinac Island is an expensive place and kitschy, too. 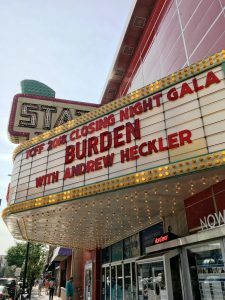 So what can you do in Northern Michigan that’s both budget friendly and not hokey? We consulted our friends Jody and Megan Terrell at Wallhanger Photography, headquartered in Kalkaska, and then we hit the road together to have some fun. 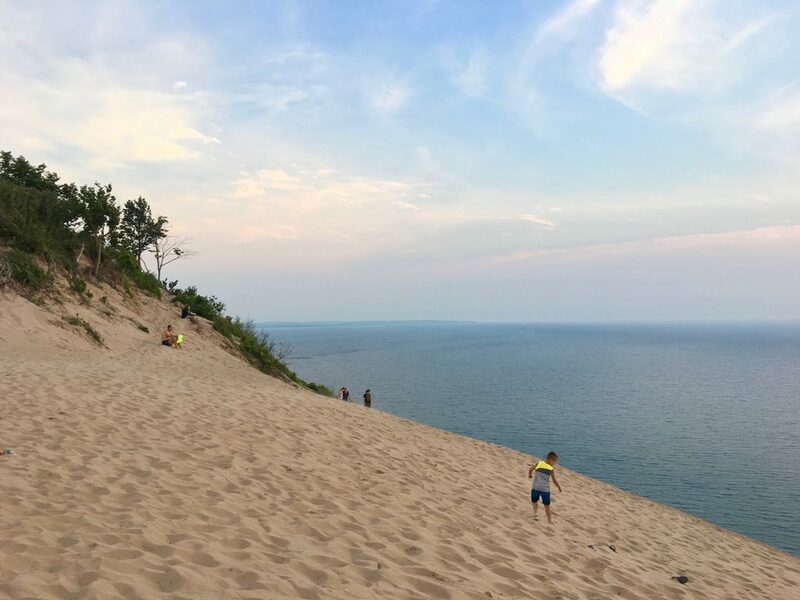 Of course, we always look for things we can do with our children, so what we have here is a Northern Michigan itinerary for a family on a budget, though for the most part these places and activities would be enjoyable without children. Since most folks have a week to travel, we created a great five-day itinerary that allows for a day of arrival and departure at either end. We are assuming you have a car, and that you’re willing to do some driving in order to take in the surroundings. We are also assuming that you have a smartphone with a maps app so you can look up directions to the places listed below. Let’s say Traverse City (Pronounced “Traver’s City”) is your home base. Traverse is a nice little city, and it’s got plenty of good places to stay. Stores downtown don’t open until 10:00am, so hit the road and drive up the peninsula in the morning. If you go up Peninsula Drive and Route 37, you could go all the way up to Old Mission Lighthouse. It’s only about a half hour’s drive. Head back to Traverse downtown for lunch (scroll down for suggestions). From there, take the pedestrian tunnel to West Bay Splash Pad to please the kids and let them burn off some steam, and also take a nice stroll around the West Bay beach area. 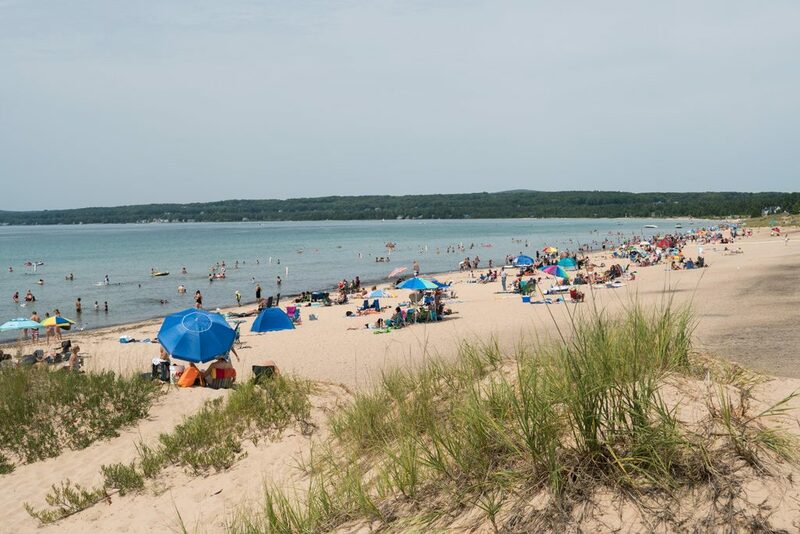 Speaking of beaches, here’s a pro tip from the Michiganders: skip the Traverse City beaches and swim elsewhere. The beaches are crowded and there are occasional e. coli outbreaks in the East Bay. Downtown has much to offer with cute stores like Cherry Republic (great for souvenirs) and Horizon Books (quite a few books by local authors! ), and the State Theater is an attraction in itself. Refurbished by Michael Moore, it shows kids movies Saturdays at 10:00 am for a mere 25 cents. The State Theater, in Traverse City, Michigan, was renovated recently and offers cheap kids movies on the weekend! Traverse City Commons is interesting, too. Talk about a colorful history: this is a former insane asylum which has been converted to upscale shops and restaurants! Besides doing some shopping, you can take a tour and see the tunnels connecting various buildings. It’s not too budget-friendly, though. 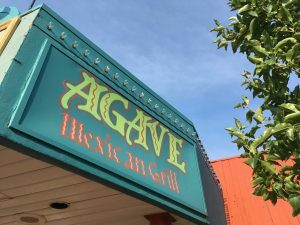 Agave is a short drive from downtown, and it is located in an uninteresting old strip mall. It is, however, probably the best Mexican joint around. Today you’ll want to get out of Traverse City and explore. So go over to Frankfort and take in Point Betsie Lighthouse. Besides the beautiful lighthouse, Frankfort has, as Megan says, “an adorable downtown,” and Crescent Bakery, voted one of Michigan’s best. Scoop of Frankfort sells Moomers ice cream, and it’s right across the street. 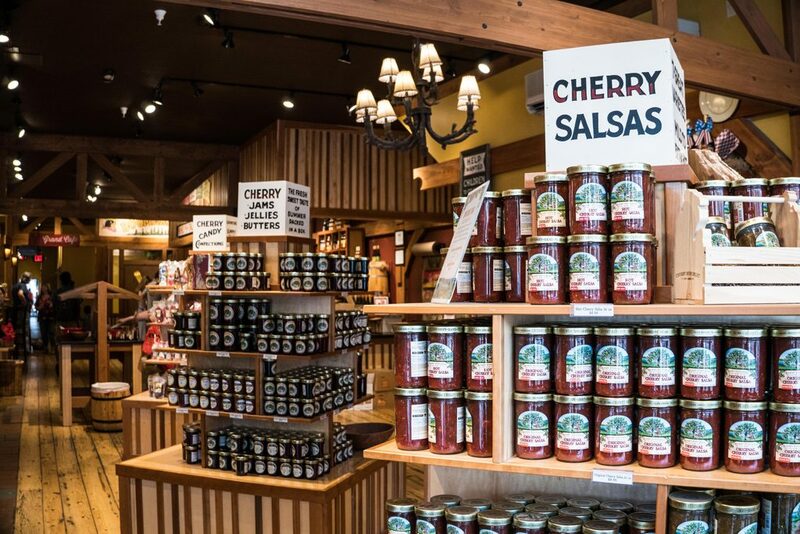 Nearby there is a popular place to snag reasonably priced souvenirs called Momentum (which also has shops in Traverse and Petoskey). Next, go to Empire for the beach and playground. After this, head to Sleeping Bear Dunes National Lakeshore. If you’ve got young children with you, you’ll want to skip the dune climb (unless you are actively trying to make your young ‘uns hate you). Instead, drive Pierce Stocking Scenic Drive and get out at the dune overlook. Should you end up in the Traverse area with time on your hands, here are some suggestions: go to the Farmer’s market (open Wed and Sat a.m.); go to the Blue Vase Book Exchange (open Fri-Sun) between Traverse City and Empire for $1 books and DVDs. We loved Short’s Brewing Company in Bellaire, but it’s almost an hour from Traverse City. Still, if you do make the drive, you’ll find some truly delicious grub and a wide range of craft brews on tap. Elk Rapids is a cute town an easy drive away from Traverse City. It has a great playground on the lake shore, and makes a good place to take the kids. Do some swimming, and then, if you’re interested in rock hunting, hop in the car and drive a mile or less to Elk Rapids Day Park, where you’ll find some interesting art exhibited, as well as crystal clear water that makes it easy to find neat rocks. You might even find a Petoskey stone, which is a special rock unique to the area. Once everyone is ready for lunch, get a slice of 7-cheese pizza at Chef Charles’ Pizza or, if you prefer cajun (or possibly need breakfast), try out Pearl’s. 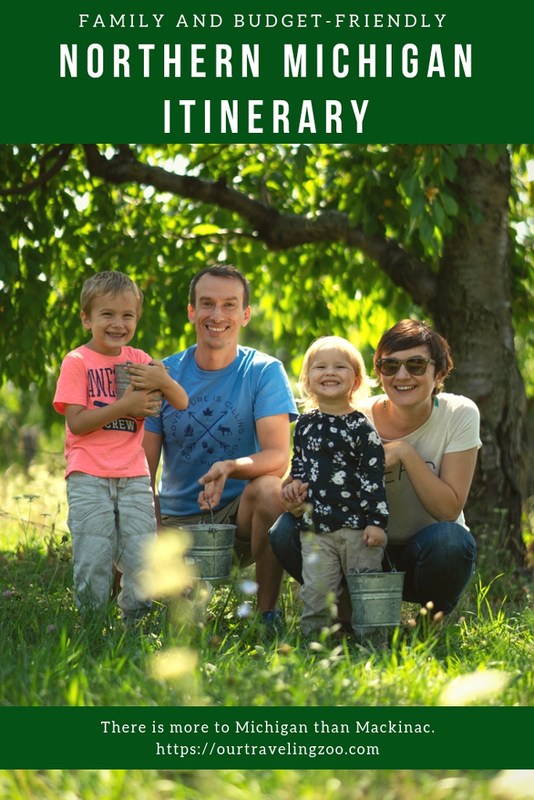 Not far from Elk Rapids there are a number of beautiful cherry orchards, and you can pick your own cherries for a quintessential Michigan experience! 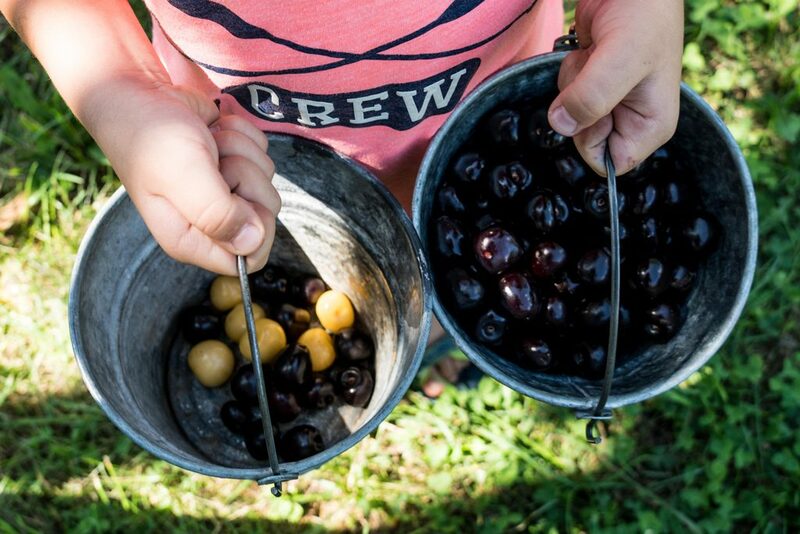 We went to Rennies Orchard and picked a-maz-ing sweet black cherries, as well as a few of the yellow cherries which are what canned Maraschino Cherries are made from (pumped full of flavoring and coloring). This should fill your day up, as well as your belly. Jenia finally got her cherry fix! This is a great place to swim! Typically it is less crowded than TC and the beach is better. There are changing facilities and showers as well as concessions and kayak rental. Our kids enjoyed running up and down a small sand dune and looking for yet more Petoskey and Charlevoix stones. After you’ve worn yourself out, head over to Charlevoix. It offers Fisherman’s Island State Park (another great place for rock hunting) and has a cute downtown. Whitefish Point. It has an interesting lighthouse, more chances to get wet (this time in Lake Superior, though) and there’s the Great Lakes Shipwreck Museum you could check out, too. Tahquamenon Falls is close by, so go have a look. Coppery water flows over the falls year round due to the tannin in the surrounding trees. Eat in Paradise at Brown Fisheries Fish House for the freshest fish around. If you have a couple of days to work with, a visit to Pictured Rocks in Munising would be fabulous, and a boat tour would be worthwhile. For most folks, though, the drive will require too much time. 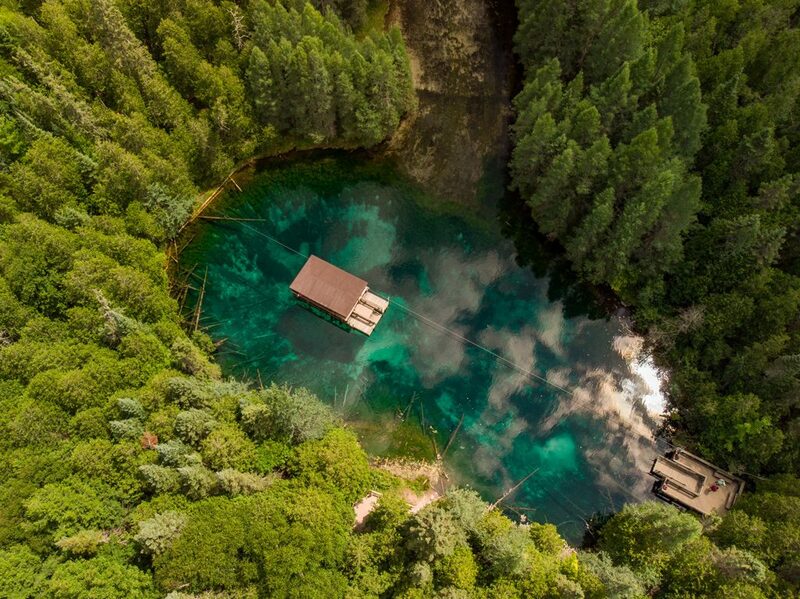 Another option would be the gorgeous blue-green spring Kitchitikipi, near Manistique, on Lake Michigan. You can float on the water for free and see huge protected trout, plus you can see to the bottom 40′ below. Like Munising, it’s a long drive from TC. Worth a mention: on the way north, the mighty Mackinac (say “mack in awe”) Bridge connects Michigan and the UP. The suspension bridge looks similar to the Golden Gate Bridge, and as you approach it, be sure to pull off and snap a photo or two. Lake Huron and Lake Michigan mingle below. We think this is a can’t-go-wrong way to spend a week in Northern Michigan that won’t have you breaking the bank. Naturally, you could mix and match the days and activities as you wish, so things work best for you. Northern Michigan on a budget with children. Possible? Yes. Here’s hoping you have a great time! Have you ever explored Northern Michigan? Have you explored Northern Michigan with a family on a budget? What would you add to or take away from the 5 day itinerary above? Let us know in the comments below! For another USA itinerary (and one of our most popular posts! ), check out our Best of Utah in A Week. We lived there for a year, so we ought to know what’s worthwhile! 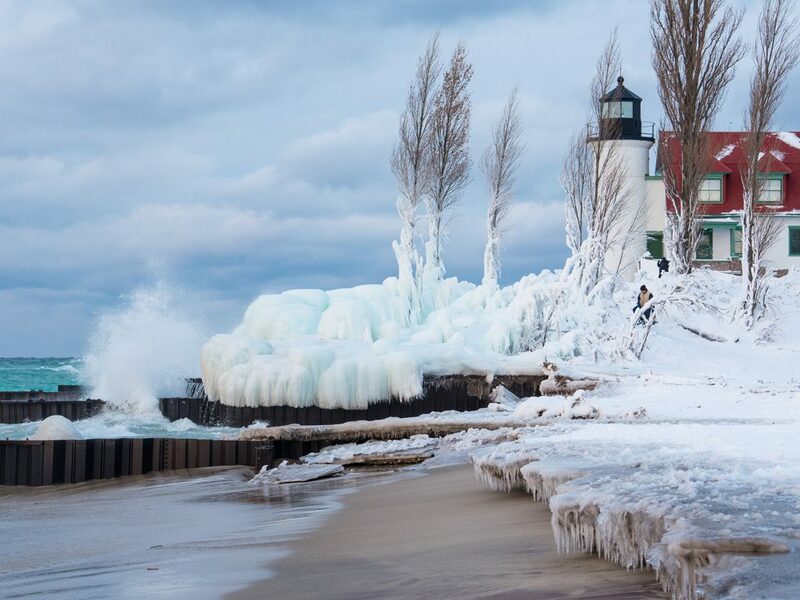 WOW that picture of Betsie Lighthouse is STUNNING – Makes me want to go to Michigan this winter. We’ve been on the exact same tour with Jody and Megan! They should start a tour guide business. Enjoyed your read. Hooray! It is a beautiful picture, isn’t it? I grew up in Traverse City, and can say you’ve covered lots of the highlights. I would add a stop in Fishtown, Glen Arbor, and Sutton’s Bay while doing the Empire day trip. These towns are way cuter than Frankfort!